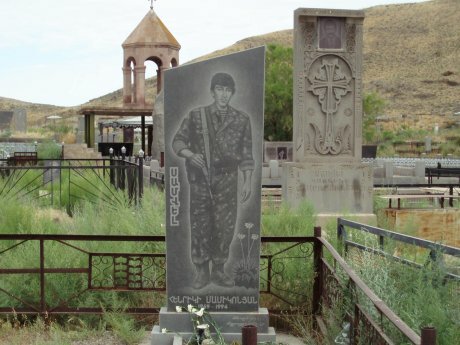 A memorial to an Armenian soldier in Nagorno-Karabakh. Flickr/David Holt. Some rights reserved. During its recent summit, early in July 2013, the Organization for Security and Cooperation in Europe (OSCE) Parliamentary Assembly called on the OSCE Minsk Group, co-chaired by France, Russia, and the United States to intensify its diplomatic efforts and find solutions to the tragic and protracted conflict in the South Caucasus. Ironically and since 1992, Minsk Group’s continued engagement with Armenia and Azerbaijan to seek solutions to the conflict over Nagorno-Karabakh has been the most proactive, but also and arguably the least productive. Surely one of the most important tasks for Armenians and Azerbaijanis in the 21st Century is to learn how to handle the regional conflict and to settle the Nagorno Karabakh question in more constructive and peaceful ways? The toll in human misery and the threat to the survival of the two people have become far too great. Rather than continuing to rely on the entrenched and mere diplomatic procedures or the perpetual fray over territorial integrity vs. self-determination, the international efforts, and more directly the efforts of the Minsk Group would be better off if focused on the concept and the practice of peace and how to achieve it. The challenge here is to think methodically within the current unpeaceful relationships and the means of transforming them into peaceful ones. No doubt, the two countries are destined to be neighbors and must look for peaceful relationships. To focus on the possibility of peace means the two sides must try to achieve together a common understanding of the kind of relationship that will avoid breeding harm. The challenge is to take the concept of peace beyond the mere absence of war or other forms of overt violence. Take the concept of peace beyond simple situation of a ceasefire or temporary truce in hostilities between the two parties. Evidently, in the absence of war many inconspicuous ways are used in which the sides have been harming each other physically, psychologically and economically even though they are not actually engaged in acts of war in the usual sense of the term. The history of conflict and violence in the region requires a careful attention on the conditions that can turn the conflict so quickly and easily to violence and war. It also evokes new ways of thinking about alleviation of these conditions. After the horrible war between the two countries in the early 1990s, the status quo in the region was fundamentally changed, giving the Armenian population in Nagorno Karabakh independence from Azerbaijan. However, the OSCE Minsk Group efforts to achieve peace in the region remain futile and confined within the traditional diplomatic language of territorial integrity and self-determination. The broader challenge is to materialize the concept of peace in a state of affairs that is beneficial for both parties. The current situation is “peaceful” simply because the sides are not engaged in direct military clash and are not at war despite the continuous threats and the bellicose language in the midst of their diplomatic relations. It is not only the question of territorial integrity of Azebaijan or the question of self-determination for Armenians in Karabakh that the co-chairs of the Minsk Group should be considering. If the primary concern is to establish peace in the region, then the central question is the social status of the people rather than internationally established political norms, such as territorial integrity. The strategy, therefore, is to achieve structural peace. This is not only a situation of ceasefire or temporary truce in hostilities in which the two sides agree to avoid war, or other forms of overt violence, but also a kind of peace that institutionalizes social relations without acts of violence and border skirmishes. A deeper sense of peace, a socially structured one, is the ultimate goal. Before Nagorno Karabakh broke away from Azerbaijan in 1988, the most pernicious ways the Armenians have been harmed under the Azeri rule were not only by the direct oppressive actions of the government, but also as a result of the way the relationships were socially structured. A systemic violence was evident in Nagorno Karabakh as an enclave of Azerbaijan. Between 1923 and 1988, when Nagorno Karabakh lingered as an enclave of Azerbaijan, the relations were harmful even though the two sides were not involved in overt acts of violence. However, the situation was far from being “peaceful” because the Armenians suffered harm from the very nature of the relationship. The laws or social and economic practices demeaned the population in the enclave and prevented them from realizing their potential as a nation. They were further excluded from the opportunities and benefits available to Azeris. That is, not only the Baku government’s particular actions but the structure itself caused the harm. Lack of peace in the region was simply a result of occupation and oppressive behavior. This is what the diplomatic language seemingly will have to divulge when talking about the regional conflict. But it generally ignores the tacit harm prevailing in the idea of territorial integrity in which the relevant relationships or political practices are largely structured. The system of apartheid, for example, was a system of “structural violence” as the well-known Scandinavian peace researcher, Johan Galtung has called it. In this situation the harm caused was systemic. A colonized or an occupied society, as well as a society trapped into an enclave are not peaceful because the laws and social practices are demeaning and establish unjust relationship. Armenians in Nakorno Krabakh were placed in such a position which became a fertile ground for overt forms of violence. The concept of Azerbaijan’s territorial integrity is not likely to be peaceful even if the Armenians were given the highest status of autonomy and self-governing. As Johan Galtung has said, peace is not just the absence of direct violence, but also the absence of structural violence. People are harmed under occupation, under colonization, or in an enclave. Violence in this case is structured in the social relationship.